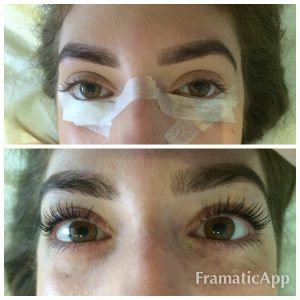 Lash lift is the new and improved form of lash perming, however it differs in the process. Instead of curling the lashes around rods (like short pencils), lash lifting LIFTS the lashes directly from the root, resulting in a lifted open-eye look that lasts for up to 6 weeks. Can be re-done every 4 weeks, for a continuous lifted look. It is perfect for all, but especially for those who desire darker, longer looking natural lashes without the need to use curlers or mascara everyday, or have eyelash extensions on a regular basis. Also a great treatment prior to eyelash extensions, if your natural lashes are VERY straight. The treatment is carried out with your eyes closed, so relax while I create a bright-eyed you! To enhance this treatment-especially advisable for lighter lashes, a tint can be applied at the same time. As can a lower lash tint to fully finish off the treatment and make your eyes look the best they can. This also eliminates the need to apply mascara daily.